Nearly 100 executives from power companies gathered for the awards night. 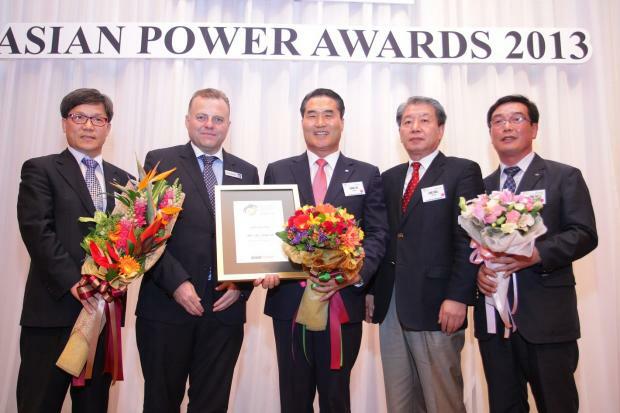 Now on its 9th year, Asian Power Awards 2013 recognized the best initiatives and projects in Asia. The 'Oscars' of the power industry held in Bangkok, Thailand was graced by nearly 100 key executives from exceptional companies in the industry who relentlessly strive for great quality and excellence in their respective categories. Silver - 100kW Offgrid Hybrid Inverter HITC for island electrification powered by Zigor HK Ltd.
Gold -Dangjin 3 CCPP - More than 60 percent efficiency for the first time in Asia - GS EPS Co. Ltd.
Gold - Chui Ling Road 132KV Substation: A Showcase of Stakeholder Participative Model and Sustainable Design in Hong Kong powered by CLP Power Hong Kong Ltd.
Silver - Integrated Call Centre with SAP BCM Support powered by Tata Power Delhi Distribution Ltd.
Gold- Eco-friendly and high-efficiency Energy Complex for Yeongheung Units 5 and 6 powered by Korea South-East Power Co.
Silver - Ongrid/Offgrid Three Phase Hybrid System HITD powered by Zigor HK Ltd. Bronze - Integrated Call Centre with SAP BCM Support powered by Tata Power Delhi Distribution Ltd.